We have a beautiful low-key weekend ahead of us! I love these weekends where we wake to the sound of birds chirping, where the days are growing longer, and we can maximize our time playing outside. I'm hoping to have lots of time in front of my embroidery machine, maybe catch a great movie or two, and curl up on the couch with my iPad. 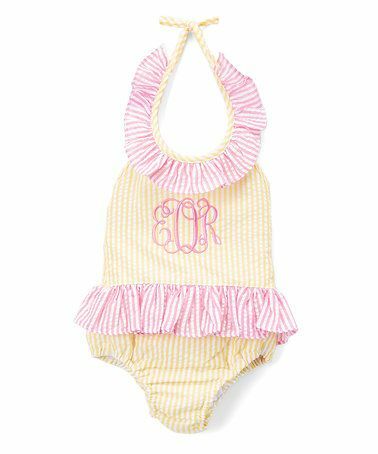 Camille needs a new bathing suit or two this year and Zulily has some of the cutest choices on sale right now. 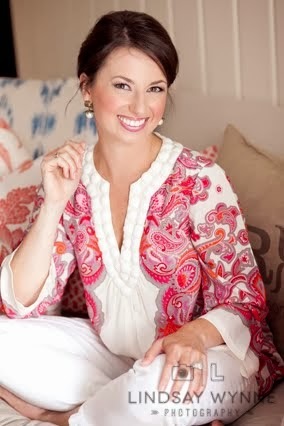 I know I talk a lot about ThredUp, but I keep on finding the best deals there! Seriously my favorite way to shop. If something doesn't fit you can send back for free and get credit toward your next purchase. It's $20.99 and remember that you can get $10 off of your first order using my referral link. 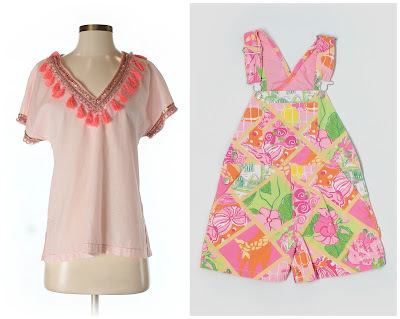 There was an awesome Lilly Elsa top there earlier this week for $40 and it got snatched up before I could add it to my cart ... hopefully by one of you! Last night Ian had dinner out with a buddy so I had a carbfest at home. The Trader Joe's sweet potato gnocchi is absolutely divine. It's probably for sharing, because the entire bag has 105% of your RDA for saturated fat, but yeahhhhhh, I ate the entire thing. While watching Big Little Lies. It was perfect. 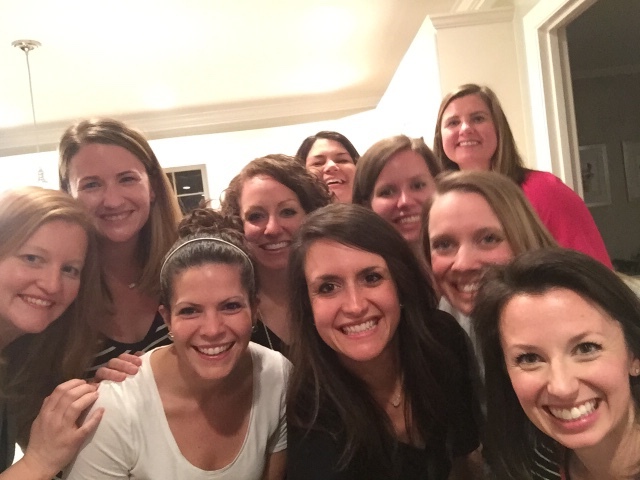 We had bunco earlier this week at Nina's house and it was so much fun! Crazy thing is, we didn't even end up playing bunco this time. We just played a few rounds of Left Right Center and then chatted around the kitchen island. This is seriously the most fun and simple game. Best $7 investment you'll make into your next girls' night or couples game night! 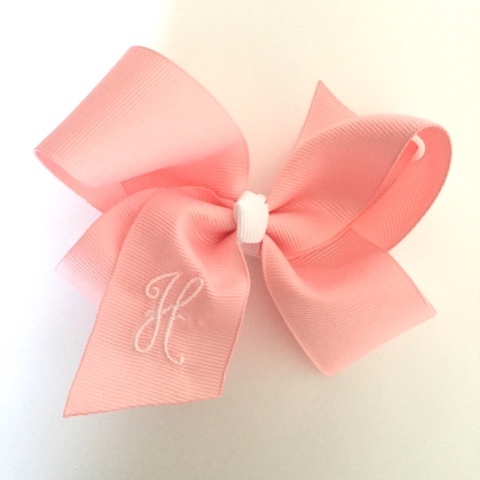 I've been making SOOO many monogrammed bows this week! Y'all have been keeping me busy and I LOVE it. I've added the pastels to our Etsy shop, and I've also sold several through a local moms group I'm in on Facebook. 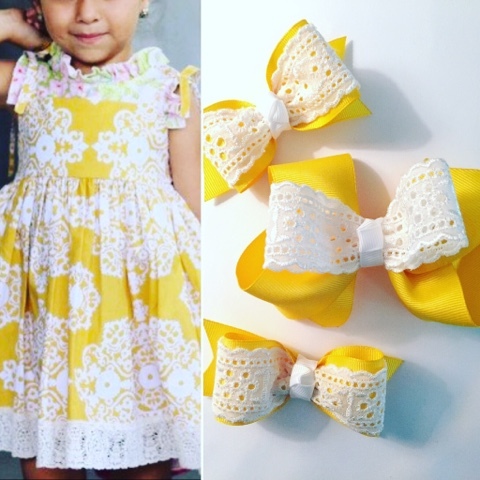 These are seriously a joy for me to create, and it is always such a pleasure seeing your little daughters/nieces/grandbabies wearing them on Instagram or Snapchat. Thank you for supporting me -- as a stay-at-home mom, it truly does make a difference in my world. Congrats on your Thred Up scores. Do you sell to them as well? I've considered it, but it looks like you literally get pennies on the dollar (if that much) for your stuff...just curious? I need to clean out but if they're only going to give me 40 cents for a shirt I'd rather donate it to a worthy cause. I.love.monograms!!! Those little bathing suits are darling and your bows are just precious!!! Have a great weekend! Gosh I am SO jealous of your monograming machine! Those bathing suits are just too cute. I have to try that sweet potato gnocchi! I love pretty much everything from TJs! Also can't wait to start watching Big Little Lies! I just got HBO for Amazon Prime! That sweet potato gnocchi looks devine! I just tried their frozen fried rice and it is pretty darn good considering it's frozen and ready in under 5 minutes. You should totally try that! I'm going to try the gnocchi. I can't wait to start watching Big Little Lies, waiting for some episodes to stack up before I start, so excited! Happy weekend! 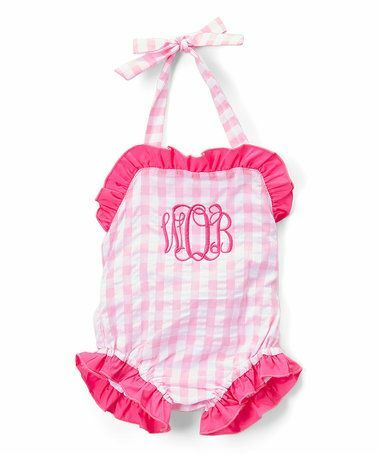 Oh and those monogrammed bows, so stinking cute! Thred Up sounds awesome and I was just thinking how I haven't had gnocchi in a while - might need a trip to TJ! Love your bows - they are adorable! Those bows are absolutely precious!! OMG! 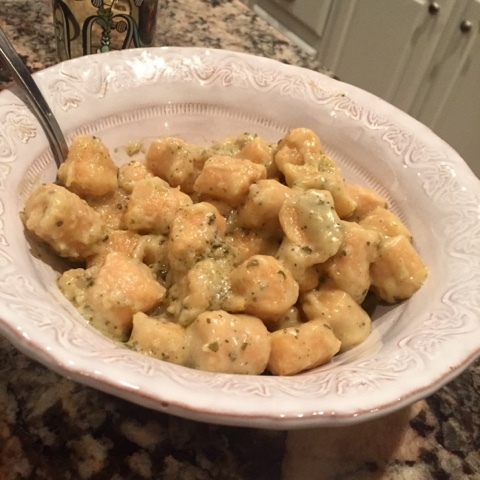 The sweet potato gnocchi from TJ's is so amazing! Those swimsuits are so cute! I love all the monogrammed items. Thanks for the tip on the gnocchi...I'm going to pick some up to stash in the freezer. 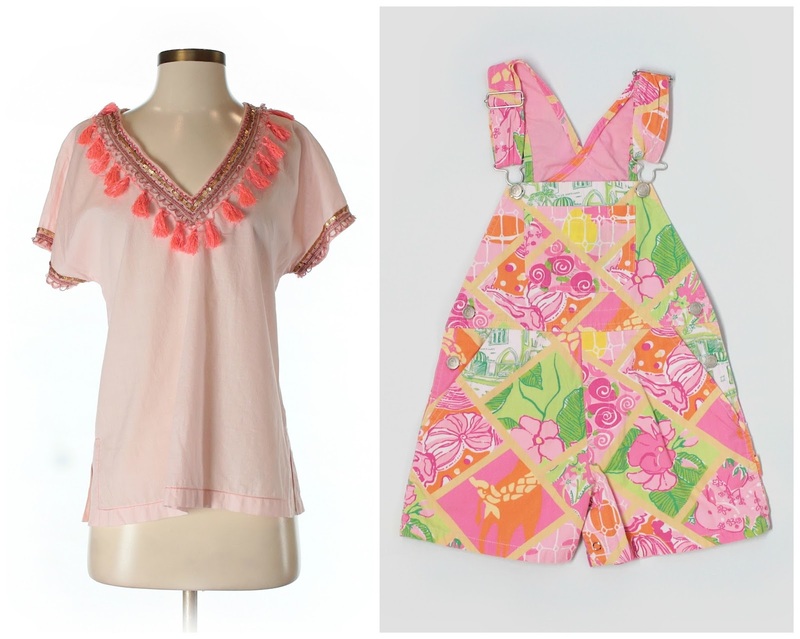 Have a wonderful weekend and thanks for linkup! The gnocchi looks amazing! I'm going to have to hunt that down and try it myself. haha. Also I love bunco! Every time I mention it, people have no idea what I'm talking about! They've never heard of it. It's such a fun game, it really should be more popular! 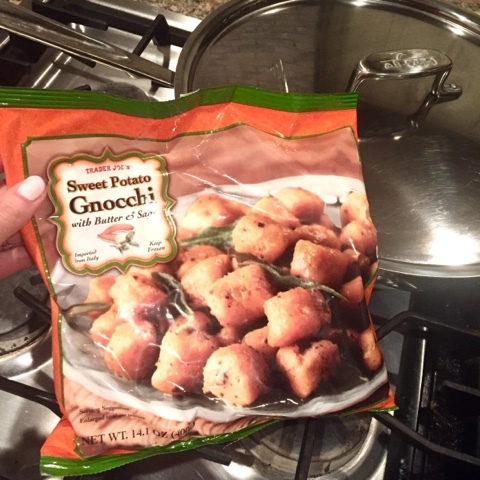 Okay, (1) I've eaten MANY a bag of sweet potato gnocchi solo (SO WORTH IT - DELISH!!!) and (2) Left Right Center is SUCH fun!! Addictive, really!